Hmm, that's a clumsy title, non? But this week's Top Ten Tuesday is really to list the authors I support the most, I guess! I now own forty-seven books by this gentleman - novels, novellas, limited editions, story collections, picture books. One day I'll own them all! I have really had to make an effort to collect his books, since they need to be imported, or found on rare book sites (since quite a few of them were produced by Subterranean Press in the US). Every time I travel to the States I go in search of more of them. Now the more shameful part - how many have I actually read? Three. Yep. Woeful. Do you know why? I have Charles de Lint as my rainy day author, the person I know I can go to in order to read stunning stories and beautiful prose. But those rainy days are too far apart, it seems. I own thirty-one novels by this author, which is pretty much all of them, I believe! And, amazingly, I have read all of them too. And reread most of them at least once. 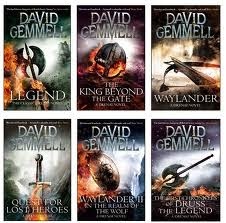 Most of this reading happened in my teens, when I first discovered Gemmell - my first novel of his was Knights of Dark Renown. Despite my efforts, I've not yet found heroic fantasy that entertains me as much as these books do. This delightful chick lit/bonkbuster author has penned fourteen awesome and clever novels. Of them, I have read nine, so I am due a big catch up! I own fifteen novels by Shinn, which is far from all the work she has produced. Of them, my favourites are still her Samaria series about the Archangels, but I am coming to love her other novels as well. I own fifteen novels, but still need to read nine of them! This wonderful historical novelist has penned thirteen novels. I own all but the latest, which is King's Ransom (published this year). I have read seven and cannot wait to dive into the ones that I haven't tackled yet. I often say that The Sunne in Splendour is my favourite novel of all time, and this is a great showcase of her talents. I own sixteen novels by this fantastically prolific YA author. I've been reading her since I was twelve years old and have, without exception, loved all her books. I haven't yet read any of the novels featuring the Circle of Magic series - I've been a devotee of Tortall and Alanna. I own twelve and have read seven. I first read this author in my early twenties, and liked her style then, but have reread some of the novels lately and find them less appealing. She does have a warm chatty style of writing that definitely isn't for everyone! Another big hitter on the fantasy scene, and I own a massive twenty-six novels by this author, even some of his non-fantasy works like High Hunt and Regina's Song. I found that Eddings worked to the law of diminishing returns - his earlier novels were his best, and the latter felt more like rehashed efforts - but nostalgia has me owning most of those he published. 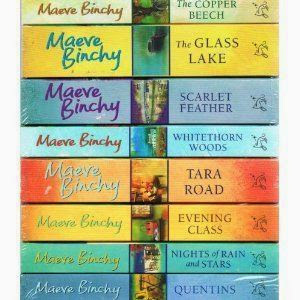 I own twenty books by this warm-hearted author, most of those she has published. I like to save her novels for when I need comfort reading, because it's like sitting in a huge armchair with a hot chocolate, getting to know her characters. I own the ten novels in the main Malazan series, the six published by Ian Cameron Esslemont, the five novellas in the Bauchelain and Korbal Broach series, and new start of the Kharkanas work. 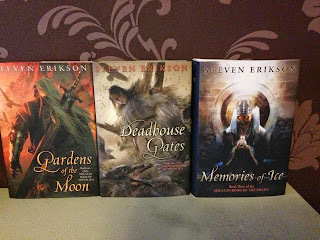 Plus, I have the three stunning special editions from Subterranean Press that have been published so far. I only wish I had the money to carry on buying these! Over to you now - which authors are those that you own the most books for?